Word Clouds - 21centuryed Tech: Digital Teacher... Welcome To The Future! Once again, I am amazed every time I talk to groups and find out so many educators have not used word clouds with their students. In fact, I am so sure that you will enjoy this topic I have now up to 170 ways to use word clouds in the classroom. I have tried to include almost every subject. These are a collection of ideas shared with me, various readings, and a lot of my own brainstorming. This is an update I promised from my previous 125 ways to use word clouds. I know this will be an article you wish to share with others. In order to better understand some of the advanced uses I suggest you may wish to read a past posts entitled, 12 Valuable Wordle Tips You Must Read. I am certain you will find at least one new idea… and again please give a retweet. Please note that if you wish two words to stay together in a word cloud using Wordle, just put a tilde between them. (Example (ice~cream~cone)By the way… have an idea I have not listed? Then just take a moment and leave a comment or email me at mjgormans@gmail.com . I thank you in advance. Now, let’s explore those word clouds! Have students discover ways they could use a word cloud to convey a concept or idea they leaned in class. 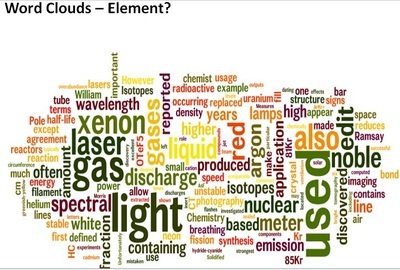 Post a word cloud from an online class discussion response and discuss what it reveals in class. Encourage students to create a word cloud to brainstorm an ideas by putting articles of interest in to word cloud and capturing ideas and words from it. Great for research! 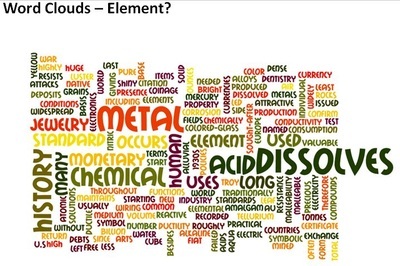 When classifying objects… make a word cloud for each classification. Remember you can make the classification heading bigger. 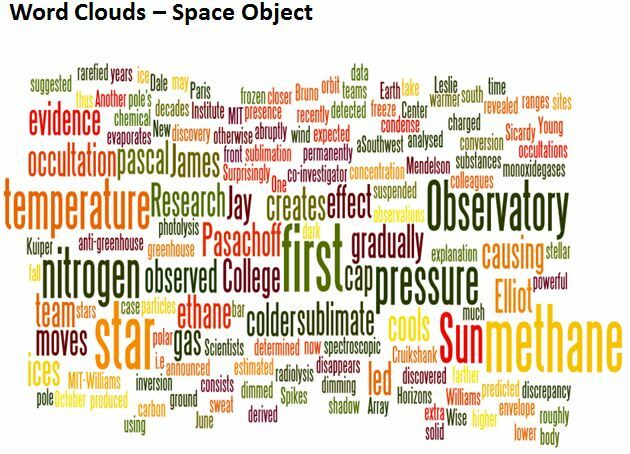 Have students compare sizes of different planetary objects and make a word cloud that can scaled for each. Make each planet a different color. Make a word cloud of different using descriptors for concepts. Make word clouds of a food chain/web allowing the font size of animals/plants to be determined by where they are in pyramid. 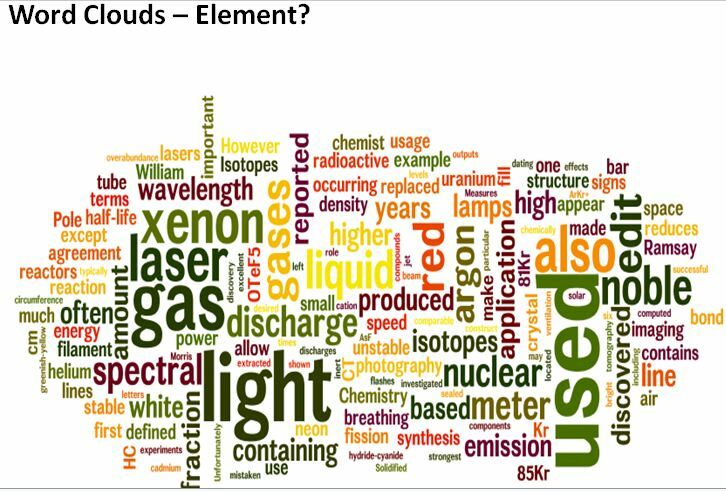 Have students create word clouds of a lab report and compare results. Are there differences… Why? Have students make word clouds or different categories of items such as body organs, simple machines, planets, systems, etc. Give students a reading of nonfiction content so they can jigsaw and explain to the class. Have them use a word cloud with their explanation as a prop. Create a word cloud of famous engineering examples with all but the name. Have students research using key words to determine what each structure is. Have students create a word cloud to illustrate a progressive change over time, example: pollution, global warming, resource depletion, etc. How can word size help? 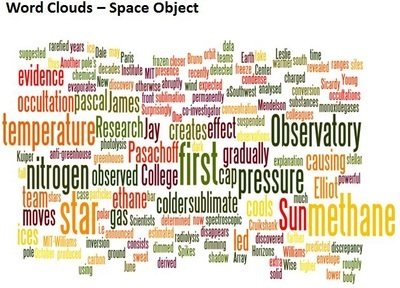 Put students hypothesis all into a word cloud and see what the crowd might say. How might it defer from their own. Create an online not googleable question that asks for a solution. Take all of the answers and create a word cloud. Ask students to use it in collaborative groups to find a new solution. Have students create a word cloud of a current event from different countries or sources and describe differences. Have students create word clouds for characters in a reading and then discuss, compare, and contrast. Compare/ contrast word clouds made from fiction and non fiction. Have students identify word clouds with out fiction or non being labeled on the word cloud. Using topics that students may have to search for… have them list search terms and put in a word cloud. Make terms that might be more reliable for a search in a larger font. Put a search term in a search engine. Copy and paste results and make a word cloud. Analyze the results. Come up with some analysis as to why certain words are larger in the word cloud. Were there any unexpected outcomes in the word cloud? Have students put words in a word cloud from a reading in order to determine pre-search words before researching. Have students compare different themes of reading with a word cloud. Have students compare different authors writings using a word cloud. Do some authors use different kinds of words more then others? How might a Wikipedia article placed in a word cloud aid in research? Have students work in collaborative groups to create an easy to hard list of spelling words. Once they have this list have them make a word cloud to show easiest to hardest that they can then study from. Let them use their imagination. Have students write a story from a word cloud you give them. Have them then word cloud their own story and post it next to the original. Have students answer a word cloud image question on line. Make word clouds of a newspaper or magazine article for a current event. A transcript from a radio, television, internet interview, podcast, etc, could also be useful for a class discussion or individual analysis. 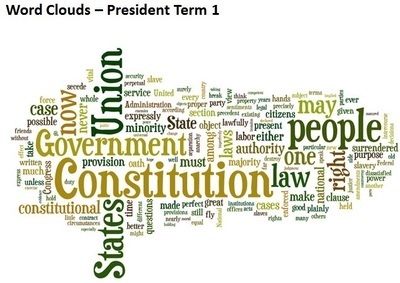 Make a word cloud for different sections of a document such as the Constitution or Bill of Rights. Can students identify the segment from a given word cloud? Make a word cloud of two famous contrasting speeches or writings. Compare/contract the two. Next, put both into one word cloud. Does the combined new word cloud give a new message? Find readings from two different countries on the same subject. Example: “american revolution”… UK/US, “space race” … RU?US … “stature of liberty FR/US. Make a word cloud of each and compare/contrast. 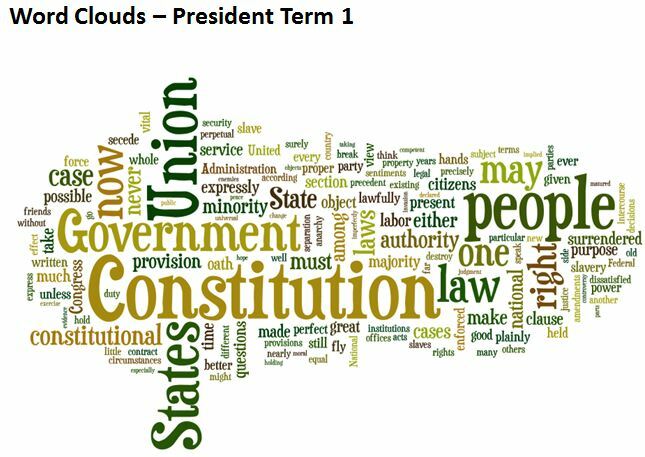 Have students create word clouds of two contrasting political parties or campaigns showing importance by size of words. Post a word cloud that has to do with history online in a forum and have students discuss. Have each make a word cloud of a current event issue and then have them write about what each one might be. Have students compare and contrast an article on the same current event from different news sources. Have students take a concepts (example… quadratics) and create a word clouds with as many examples as how it is found in the real world. Have student make a word cloud that compares and contrasts two different lifestyle habits. Have students create a word cloud from a favorite passage and then illustrate it with out words. Hang them up and see if students can match them together from a class. Have students research and create a word cloud from different music genres. Be sure they emphasize certain words over other and are ready to defend reasoning. Have students look up different terms of the arts in Wikipedia and then make a word cloud. Why do some words stand out more then others? Ask students to create a word cloud on a certain aspect of a country custom or culture. Have students respond online to an idea the teachers posts online using foreign words in a word cloud that together mean something. Have students take a famous person from their culture and create a word cloud using foreign words of them. Make sure some words are bigger then others and be ready to explain. Have students take a math or science concept and create a word cloud of how that concepts relates with real life. 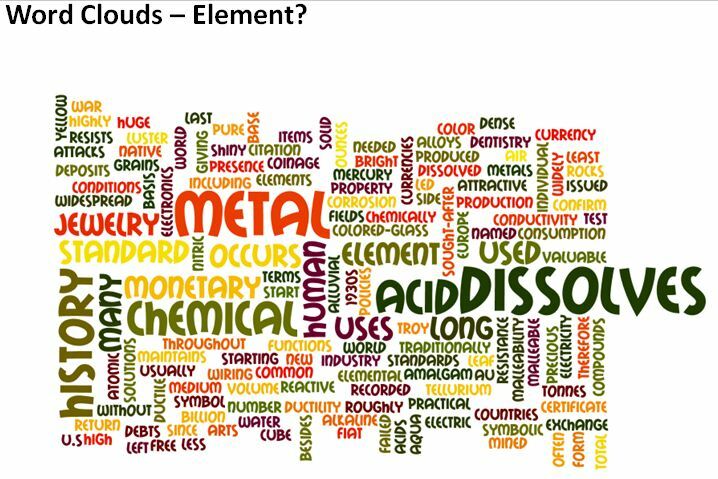 Have students create word clouds that refer to important technical vocabulary words. Have students respond to online posed word clouds by teacher to begin a discussion in a subject area being taught. Create a word cloud describing a career. Create word clouds of a combination of careers. Have size of career font be determined by a relationship between careers such as; need for career, education necessary, earning power. Create word clouds of different Colleges and Universities. Hang them all up and have students guess each one. Create word clouds highlighting a career and classes need to take obtain that occupation. Make word clouds of career clusters. Have a student create a career word cloud showing their thoughts from least to most interest. Point out need for size of words. Have students take a area of learning and create a career cluster off of it. Present a word problem and have students list careers needed to solve it. Have them try to prioritize occupations by size. Ask them to think outside the obvious. Have students create a word cloud of various job descriptions. What words seem to be used over and over. Have them out some job descriptions together and see results. Have students create a word cloud comparing jobs of different eras.